Enlarge Adapter: RCA plug to BNC coupling. High-quality adapter for connecting cinch to BNC. The innovative locking method and the high-quality contact surfaces ensure that this Oehlbach BNC plug always creates reliable connections to the connected electronic components - e.g. AV receivers, mixing desks and projectors. 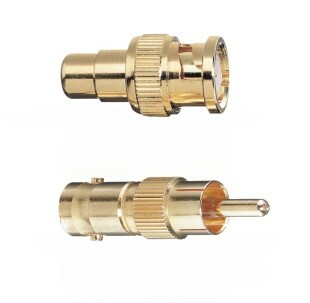 All plug contacts are plated with 24 carat gold.